In early September, Ukraine inched closer to a globally recognized national Orthodox church when Constantinople Patriarch Bartholomew placed the country under the canonical jurisdiction of US Archbishop Daniel of Pamphilon and Canadian Bishop Ilarion of Edmonton. This move was the latest in a series of blows to the Kremlin as Moscow faces up to the prospect of losing a religious struggle in Ukraine that could have far-reaching earthly implications. Since 1685, the Russian Orthodox Church has claimed that Ukraine lies within its canonical territory. However, these claims no longer enjoy canonical credibility. The two recent appointments by Constantinople are part of preparations to grant the Orthodox Church in Ukraine autocephaly (independence) from the Russian Orthodox Church. It is no exaggeration to state that the granting of autocephaly from the Russian Orthodox Church to Ukraine’s millions of Orthodox believers is as significant for Ukraine as the disintegration of the USSR. Indeed, many observers believe that separating Ukraine’s Orthodox Church from Moscow is the last step the country needs in order to become truly independent. Why have the stars suddenly aligned now? Ukraine has been actively seeking autocephaly since before it became independent in 1991. When Metropolitan Filaret broke with the Russian Orthodox Church to establish the Ukrainian Orthodox Church-Kyiv Patriarch (UOC-KP) during the Soviet collapse in 1991, Constantinople did not recognize the move. Meanwhile, facing mounting pressure from the Ukrainian drive for independence, the Russian Orthodox Church revived the autonomous status of its exarchate in Ukraine and renamed it the Ukrainian Orthodox Church (UOC). Due to these rival maneuvers, there have been two competing Orthodox churches in Ukraine ever since. The UOC has been loyal to Moscow and has enjoyed international recognition, while the UOC-KP has been unrecognized but is widely seen to represent an independent Ukraine. Since Russia’s annexation of Crimea and military aggression in eastern Ukraine, the split loyalties of the Russian Orthodox Church and UOC have left them unable to maintain the appearance of neutrality. Russian Orthodox Church clergy have blessed Russian nationalists traveling to fight in the Donbas. Some UOC clergy have refused to serve at funerals of Ukrainian soldiers, while UOC Metropolitan Onufry (Berezovsky) and fellow senior clergy refused to stand in the Ukrainian parliament in honor of slain Ukrainian soldiers. This has had a major impact on public opinion, with millions of Ukrainians questioning how they can remain within a church that takes sides against their nation. There is another factor currently working in favor of Ukraine’s Orthodox independence bid. Until 2014, Ukraine’s post-Soviet leaders had lacked the political credentials to secure progress towards Orthodox independence. As the former ideological secretary of the atheist Communist Party in Ukraine, the country’s first president of the independence era Leonid Kravchuk had no legitimacy on church-state matters. Meanwhile, President Viktor Yushchenko’s strong support for the UOC-KP and was perceived by many within the Orthodox church as being too anti-Russian. President Leonid Kuchma was even-handed, while President Yanukovych openly backed the Russian Orthodox Church. 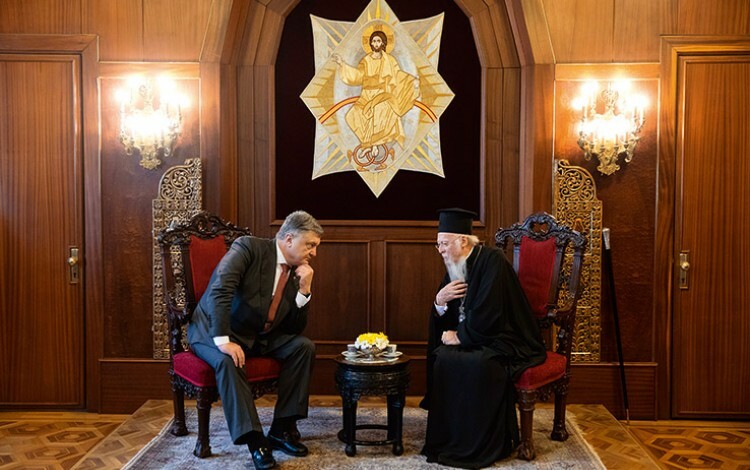 President Petro Poroshenko is a deacon in the UOC and Constantinople does not view him as “anti-Russian.” Importantly, due to his influence, senior UOC clergy have supported the UOC-KP and the smaller Ukrainian Autocephalous Orthodox Church in seeking autocephaly. The Ukrainian parliament also strongly backs Orthodox independence. In addition to these advantages, President Poroshenko has adopted a legalistic approach to seeking autocephaly that has left the Russian Orthodox Church with little room to maneuver. Events taking place far beyond the borders of Ukraine are also playing a role in the unfolding religious struggle between Moscow and Kyiv. Russia has overplayed its hand in the Balkans and many believe this has helped to undermine Moscow’s position within the Orthodox world. Russia’s involvement in an attempted coup in Montenegro to thwart the mountain nation from joining NATO garnered international headlines in 2016. More recently, the region has seen the expulsion of Russian diplomats from Greece for allegedly attempting to derail Greek rapprochement with Macedonia (a development that that opens the way for the latter to join NATO and the EU). This was a particularly shocking development in light of the traditionally strong ties between Moscow and Athens. The decision to grant Ukraine autocephaly has much to do with size and power. Within the Orthodox world, it seems as though both Greece and the Constantinople Patriarch have had enough of Russia’s overbearing interference. They see the emergence of an autocephalous Ukrainian Orthodox Church as a way of cutting Moscow down to size. Indeed, the process could eventually lead to Russian losses that are disproportionately larger than Ukraine itself. In the USSR, two-thirds of Russian Orthodox Church parishes were located in Soviet Ukraine. Today, despite Ukraine having less than a third of Russia’s population, both countries have roughly the same number of Orthodox parishes (14,000). This concentration of parishes in Ukraine does not directly correlate with traditional geographical understandings of pro-Russian sentiment in the country. In Soviet Ukraine, the majority of Russian Orthodox Church parishes were in western and central Ukraine, and that remains the case today. It was always therefore wrong to describe Ukraine as divided between “Catholic West” and “Orthodox East.” There are actually far fewer Russian Orthodox parishes in the Donbas than elsewhere in the country. Due to these regional realities, there is relatively little chance of a “civil war” breaking out in Ukraine over religion. Instead, a majority of the UOC faithful are more likely to join Ukraine’s new autocephalous church. Another key issue at stake is national identity. The USSR and Russian Federation have used the adoption of Orthodoxy by Kyiv Prince Volodymyr the Great in the late tenth century in order to lay claim to Kyiv Rus as the “first Russian state.” Many Western journalists repeat this falsehood, which is nearly always included in Western histories of Russia. Both Russian and Western historiographies tend to ignore the inconvenient existence of Ukrainians. Even when acknowledged, they typically appear as virtually indivisible from Russians and Belarusians. Russians believe, and Russian President Vladimir Putin constantly reiterates, that Kyiv Rus gave birth to the three eastern Slavic nations of Russia, Ukraine and Belarus. Throughout the Tsarist, Soviet, and contemporary eras, Russia’s goal has always remained to achieve a reunion. These ideas have gained additional momentum in the post-Soviet era as the Kremlin has sought to replace the lost ideological arguments for closer union of the Communist epoch. In the late 2000s, the Kremlin began to promote the concept of a so-called Russkiy Mir (Russian World) that stretched far beyond the boundaries of the modern Russian state to embrace millions of ethnic and cultural kinsfolk cut off by the Soviet collapse. The objective was to unite Belarus, Russia, and Ukraine around the Russian Orthodox Church to form the core of the future Eurasian Economic Union. Putin and Russian nationalists believe Ukrainians and Belarusians to be different branches of the broader “Russian” people, with Ukrainians cast in the role of “Little Russians.” Putin is fond of expressing the opinion that Ukrainians and Russians are actually “one people”’. On occasion, he has gone further. At the NATO-Russia Council in 2008, Putin called Ukraine an artificial state. Perhaps unsurprisingly, these overtures have not proved very persuasive to the increasingly self-assured Ukrainian audiences of the post-Soviet years. Ukraine decisively rejected the Russkiy Mir ideology in 2014, resulting in the failure of Kremlin-orchestrated uprisings in a host of Ukrainian regions and leading to the current stalemate in eastern Ukraine. Support for membership in the Eurasian Economic Union has likewise plummeted. Autocephaly will reinforce the growth in Ukrainian patriotism while supporting further national integration and spurring a final divorce from Russia. The final factor is geopolitics. An independent Ukrainian Orthodox Church would undermine Russia’s position as the world’s biggest Orthodox Church. The Ukrainian and Romanian Orthodox Churches would both be roughly equal in size. Meanwhile, Constantinople would have a staunch Ukrainian ally in its dealings with the Russian Orthodox Church. While the Russian Orthodox Church is predictably anti-Western much like the Putin regime itself, an independent Ukrainian Orthodox Church would be pro-European. This would radically alter the balance of power within the Orthodox world. Within Ukraine itself, autocephaly would deepen the ongoing strengthening of Ukrainian national identity. This is an identity rooted in the concept of European integration and increasingly distant from a Russian state perceived as both hostile and unattractive. Since 2014, Russia’s soft power in Ukraine has collapsed. According to one recent survey, only 1% of young Ukrainians support the Russian model of development, while around 70% of Ukrainians oppose it, including 56% of Russian speakers. This reflects deteriorating attitudes towards modern Russia as a civilizational partner. The Russian Orthodox Church is the last major source of Putin’s soft power in Ukraine. If Constantinople now completes the process of Ukrainian Orthodox independence, Ukraine’s movement out of Russia’s orbit will become irreversible. In that sense, the creation of an autocephalous Ukrainian Orthodox Church is Ukraine’s ultimate answer to Putin’s aggression.